Tony is a Professor of Biochemistry within the Wellcome Trust Centre for Cell-Matrix Research in the Faculty of Life Sciences (see http://www.wellcome-matrix.org/). During most of his career he was based at the University of Oxford where he obtained a BA in Chemistry from Exeter College (1985) and a DPhil from Wolfson College (1988). Between 1988-1998 Tony was a Research Fellow within the Department of Biochemistry, University of Oxford, including an Arthritis Research UK (ARUK) Research Fellowship from 1991-1998. In 1998 he became a member of MRC Senior Scientific Staff within the MRC's Immunochemistry Unit (Oxford). In October 2005 he took up his current post at the University of Manchester. 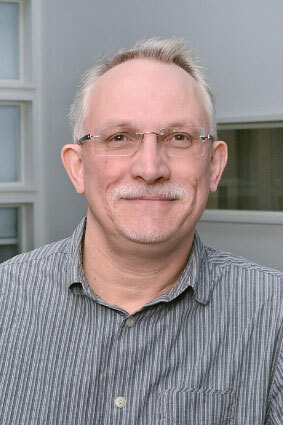 Tony has published over 160 scientific papers and currently has grants from Arthritis Research UK and MRC. He is a Founder Member (and former Trustee) of the International Society for Hyaluronan Sciences (see www.ishas.org/) and has served on the MRC's College of Experts and the Editorial Board of the Journal of Biological Chemistry. Tony was elected as a member of the Academia Europaea in 2012 and joined the Council of the International Society for Matrix Biology in 2016. In 2018 he will serve as chair for the Gordon Research Conference on Proteoglycans. Glycosaminoglycans in extracellular matrix organisation: Are concepts from soft matter physics key to understanding the formation of perineuronal nets?